Nigerian troops, backed by air strikes, have reclaimed the towns of Monguno and Marte from Boko Haram, according to a military statement. Meanwhile, Cameroon says its army has killed more than 80 Boko Haram soldiers and arrested 1,000 of their supporters. Niger also claimed on Monday to have arrested 160 people with links to Boko Haram since 6 February. Nigeria, Chad, Cameroon and Niger recently formed a military coalition against the Islamist militants. Representatives from the four countries are currently in the Cameroonian capital of Yaounde with other African leaders to discuss how best to tackle Boko Haram. In recent months, Boko Haram had seized control of much of Nigeria's north-east, amid widespread criticism of the Nigerian army. But backed by its neighbours, especially Chad, some territory has been recaptured in recent weeks. However, the coalition has had setbacks too. 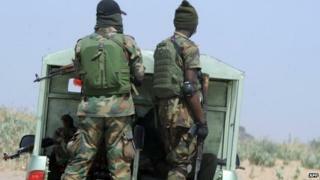 A spokesperson for Cameroon's defence ministry said five soldiers were killed in the recent clashes with Boko Haram. Meanwhile, an official from the US Africa Command told the BBC that they would provide Nigeria with training and equipment to combat Boko Haram. Lt-Gen Steven Hummer said Africa Command was "ready to assist in whatever way [Nigeria] see as being practical". However, he did not clarify how much support Nigeria could expect to receive. The US has previously voiced concerns over helping the country because of its human rights record. A senior US official told the BBC that there were also worries over the lack of political will to defeat Boko Haram. Assaults by Boko Haram have intensified recently, prompting the Nigerian government to delay elections scheduled for 14 February by six weeks. Despite this, Nigeria's President Goodluck Jonathan has promised elections will take place on 28 March. But as well as the security threat posed by the militants, officials must deal with the problem of pre-election violence. Last week, Nigeria's National Human Rights Commission reported that 58 people have been killed since campaigning began 50 days ago. The election is seen as the most closely fought since the end of military rule in 1999.